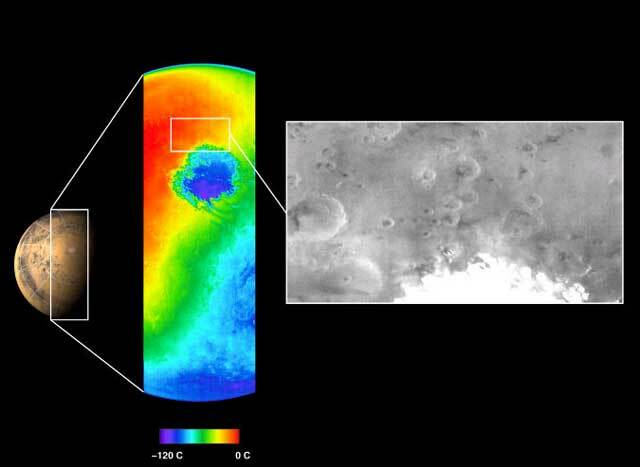 NASA's 2001 Mars Odyssey spacecraft has now entered the main aerobraking phase of the mission. "The initial phase of aerobraking has gone exceedingly well. By skimming through the upper reaches of the Mars atmosphere during each orbit, we have reduced our orbital period by more than three hours in the past two weeks," said David A. Spencer, the Odyssey mission manager at NASA's Jet Propulsion Laboratory, Pasadena, Calif. Odyssey's orbital period, the time required for the spacecraft to complete one revolution in its orbit around Mars, is currently 15 hours. The spacecraft's closest approach to the planet, know as the orbit's periapsis, has been carefully lowered to 110 kilometers (68 miles) above the martian surface. "This closest approach occurs over the north polar region on Mars, in a relatively low density region surrounded by strong winds like the jet stream on Earth," said Dr. Richard Zurek of JPL, who chairs the aerobraking advisory group. "Like Earth, Mars has distinct seasons, and this low density area, called the polar vortex, develops each fall and will persist until spring, long after Odyssey has finished aerobraking,"
NASA's Mars Global Surveyor spacecraft is monitoring the lower atmosphere of Mars, observing the entire planet each day to watch for dust storms and weather events that could affect the upper atmosphere. If needed, Odyssey could also use its own instruments to watch for dust storms. To that end, flight controllers have completed the calibration and testing of the thermal emission imaging system. The imaging team at Arizona State University, Tempe, took the first visible wavelength image of the planet on Nov. 2, which complements the thermal infrared image that was taken earlier. The aerobraking phase is planned for completion in late January 2002. At that point, Odyssey will be in its desired circular orbit, and the science mapping mission will begin sometime in early February. 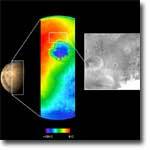 JPL manages the 2001 Mars Odyssey mission for NASA's Office of Space Science, Washington, D.C. Principal investigators at Arizona State University in Tempe, the University of Arizona in Tucson, and NASA's Johnson Space Center, Houston, Texas, operate the science instruments. Lockheed Martin Astronautics, Denver, Colo., is the prime contractor for the project, and developed and built the orbiter. Mission operations are conducted jointly from Lockheed Martin and from JPL, a division of the California Institute of Technology in Pasadena. NASA's Langley Research Center in Hampton, Va., is providing aerobraking support to JPL's navigation team during mission operations.